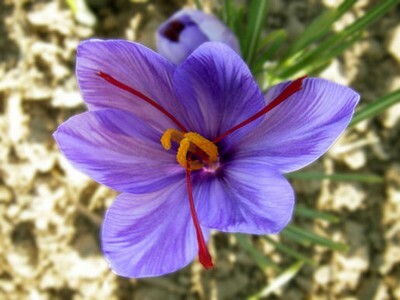 The saffron that we use is actually the stigma or style of the Saffron Crocus flower. Saffron benefits health in numerous ways but it is an expensive spice because each saffron flower produces only about three stigmas. Thus, almost 14,000 flowers are required to produce merely an ounce of saffron spice. Moreover, it is a delicate and labor-intensive crop. Saffron is considered excellent for skin. Plus, it is useful in relieving colic, flatulence, insomnia, depression, baldness, etc. The spice is deep orange or red in color. Producers often mix safflower, calendula, pomegranate fibers, marigold, and other similar herbs with saffron and sell the adulterated mixture as saffron. 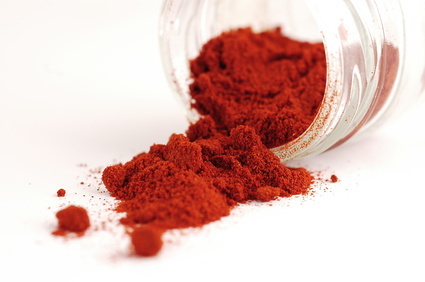 Pure and unadulterated saffron powder is red in color. The spice is highly aromatic and has slightly bitter taste. Scientific Name: Crocus sativus L.
Saffron is indigenous to Greece and Asia Minor. Nowadays, this expensive spice is grown in Spain, Turkey, France, Greece, Italy, Iran, and India. It belongs to the Iridaceae family. 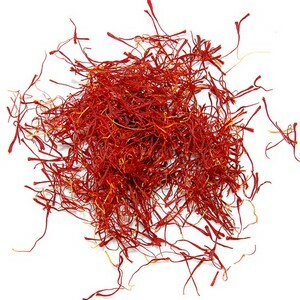 Saffron has stimulant, stomachic, antispasmodic, emmenagogue, diaphoretic, laxative, diuretic, and aphrodisiac properties. It also has strong dying properties. Saffron benefits in the treatment of depression and epilepsy as it acts as an anti-depressant. It influences the serotonin activity in the brain. Moreover, it helps reduce cramps and fevers. This herb supports the cardiovascular, digestive, reproductive and nervous system. Thus, it is useful in curing dyspepsia, bloating, flatulence, colic, insomnia, memory loss, anemia, inflammation, arthritis pain, and so on. Saffron tea contains antioxidants that reduce the risk of developing heart disease. It reduces cholesterol and regulates blood pressure. Plus, saffron has anti-cancer qualities as it includes a compound called crocin which inhibits the growth of human cancer cells. Scientists have also found benefits of saffron for eyes as this herb helps reverse age-related macular degeneration. Furthermore, it is useful in getting rid of respiratory infections and disorders such as cough, cold, flu, asthma, etc. Here’s a video giving information on saffron health benefits. In addition, it is works as an effective home remedy for skin care, especially for reducing skin discoloration. Plus, it heals bruises, sores, and acne. Saffron promotes memory retention, too. It improves circulation, protects the liver, and helps in removing kidney stones. The antioxidants present in this spice boost immunity. Moreover, saffron oil and extracts aid in weight loss as it helps in burning carbohydrates and prevents you from overeating. It provides relief from menstrual problems like premenstrual syndrome (PMS) as well. In terms of nutrition, saffron is rich in proteins, iron, calcium, magnesium, potassium, copper, zinc, selenium, vitamin A, vitamin C, and B vitamins, especially riboflavin. • Regular consumption of saffron tea is good for heart. To prepare this tea, steep three strands of saffron stigma in a cup of hot water for about 20 minutes. Enhance the taste as well as health benefits of saffron tea by adding other spices like cinnamon in it. • Intake of saffron tea benefits in reducing stomach ulcers and preventing gastritis as well. Drink this tea twice daily because it assists in gastric flow. • Taking a combination of a pinch of saffron and half a teaspoon of clarified butter is useful for individuals suffering from diabetes. 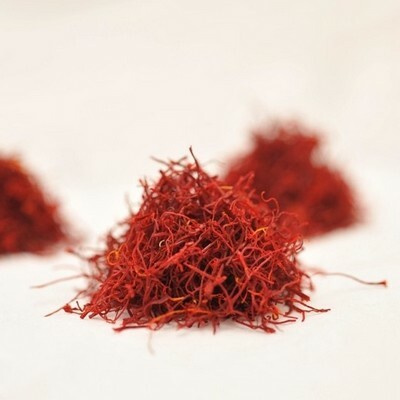 • Consuming an infusion prepared by steeping about six to eight saffron threads in half a cup of water helps cure stomach gas, insomnia, and colic. • Having a tincture prepared from this herb is valuable in healing fatigue. For this, you need to add saffron stigmas in a cup of vegetable oil and drink water mixed with two drops of this oil. Follow this therapy three to four times in a day. • Applying warm milk mixed with half a teaspoon of saffron on the forehead, temples and around the nose provides relief from cold and congestion, especially in children. • Another benefit of saffron is that it reduces premenstrual syndrome and symptoms like abdominal cramps, bloating, and irritability. To prepare this natural remedy, you need to boil a teaspoon of saffron in a quarter cup of water until it reduces to almost one tablespoon. Divide the solution in three parts and drink each portion mixed with an equal amount of water three times in a day. Follow this therapy for two days. Taking saffron supplements are also useful in this regard. • Regular consumption of a pinch of saffron mixed in warm milk or water serves as one of the easiest saffron home remedies for purification of blood. When taken before bed time, it induces sleep and cures insomnia. • Boil about 30 ml water and add half a teaspoon of saffron in it. Let it steep for about 20-30 minutes. Finally, take a teaspoon of this solution every hour to reduce fever. Continue taking this infusion until the temperature becomes normal. • Massaging the gums with saffron powder (you can also add honey or glycerin) helps in reducing soreness and inflammation. • Mix one tablespoon each of liquorice root and milk. Grind the mixture and add a pinch of saffron powder in it. Finally, apply this paste on bald patches before going to sleep. Follow this treatment regularly for a few weeks to cure hair loss and baldness. • Regularly consuming a tablespoon of milk mixed with a pinch of saffron on an empty stomach early in the morning lightens skin color. In addition, you can apply a combination of milk, saffron and a paste prepared from blanched almonds on face. • Applying a face pack prepared from saffron, sandalwood, and a little water (you can use rose water, too) is valuable in getting rid of pimples, blemishes, and dark circles under eyes. • For urinary problems like urine retention, health benefits of saffron can be derived by soaking it in water overnight and taking it along with a teaspoon of honey in the morning. • Sexual debility can be removed by drinking a cup of milk mixed with 1/8 teaspoon of saffron in it. Take this home medicine two times in a day. • When dealing with problems like low sperm count and erectile dysfunction, prepare a home medicine by frying five or six blanched almonds in clarified butter (ghee), grinding them along with a small amount of milk and saffron to form a paste. Consume this mixture in the night before going to sleep. • Saffron has uterine stimulant effects. Thus, it should be avoided in early stages of pregnancy. When taken in the later stages, though, it encourages uterine contractions. So, pregnant women can have half a cup of milk mixed with a pinch of saffron to induce labor. • Taking meadow saffron (Colchinum autumnale) in dilute form is considered effective in treating gout and leukaemia. However, as this herb is likely to be toxic, it is recommended to take your doctor’s advice before using it as a medicinal cure. Apart from these medicinal uses, saffron is added in foods to enhance their color and flavor. The best way to use this spice while cooking is to soak it in a little warm water or milk for about 10 minutes and then add it in the food. Moreover, this herb is used in certain religious ceremonies. It is the most expensive spice in the world. Individuals suffering from kidney disease and bipolar disorder should use this herb with caution. Plus, although saffron benefits in improving health, it is not considered safe for pregnant and breastfeeding women. Having large doses of saffron can cause hypomania and produce narcotic effects. Excessive consumption of this spice has an adverse effect on the central nervous system. 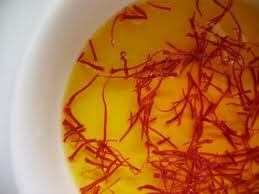 Other side effects of saffron include nausea, vomiting, headache, anxiety, and drowsiness. How saffron (Zafran) can be used for improving sperm thickness and Stamina? Regularly consuming a tablespoon of milk mixed with a pinch of saffron on an empty stomach early in the morning lightens skin color. In addition, you can apply a combination of milk, saffron and a paste prepared from blanched almonds on face. I have a question instead. I just borugh a bottle on Saffron Threads by Morton & Bassett. There were 4 little plastic containers in the bottle and on the bottle it states .01oz – .4g. I steeped the contents from one the plastic containers in water in the bottle that they came in. Is it safe for me to take 1 tbsp 3 X day to surpress my appetite or can I take more?